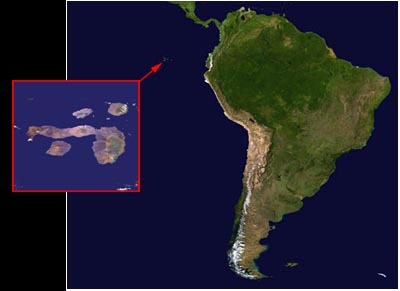 The Galapagos Archipelago is a cluster of some 13 volcanic islands and associated islets and rocks located just under the equator, about 600 miles west of Ecuador in South America. The oldest of the islands are about 4 million years old and the youngest are still in the process of being formed. Indeed, the Galapagos islands are considered to be one of the most active volcanic areas in the world. Following the bishop, the islands were rarely visited and became the refuge for pirates and privateers preying on Spanish galleons and coastal towns. Subsequently they became the haunts of whalers and sealers. The biggest attractions to these visitors were the fur seals and the giant tortoises. Tortoises could be kept alive in the hold of ships for up to a year with no food or water so, needless to say, the tortoise populations were decimated. Each island has its own unique variety of tortoise and the depradations caused the extinction of several and placed most of the others on the endangered list. Today, the Pinta island tortoise is survived by a single male, named "Lonesome George". 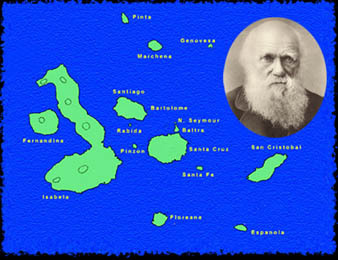 Charles Darwin was the first to make a scientific study of the islands in 1835. He was a young student just out of university and was the naturalist on a round-the-world scientific and geographical voyage on board HMS Beagle (1831 - 1836). He had spent the previous four years exploring the geology and wild-life of South America. In later life, Darwin maintained that the Galapagos were the source of all his ideas and research and, of all the visitors there, the Galapagos are today most closely associated with Darwin. Today the Galapagos are owned by Ecuador and are maintained as part of that nation's national park system. About 95% of the islands are part of the park, with the remainder being inhabited by about 14,000 people in four major communities. The islands are jointly operated by the Galapagos National Park Service and the Charles Darwin Research Station. The Park Service provides rangers and guides, and is responsible for overseeing the many tourists who visit each year. The Darwin Station conducts scientfific research and conservation programs. It is currently breeding and releasing captive tortoises and iguanas.